The following services are available - please ask at reception for details. Patients will be required to complete a Travel Immunisation Questionnaire. Please request one from Reception. The completed forms will be reviewed by the Practice Nurse. A charge will be made for certain immunisations and vaccinations that are not covered by the NHS. A list of these changes is held at Reception or above under Non-NHS Services. Personal counselling by referral from your doctor or nurse. The practice works closely with Live Life Better Derbyshire to provide help and support regarding Health, Wellbeing, Weight Loss and Smoking Cessation. For further information please go to livelifebetterderbyshire.org.uk, email llbd@nhs.net or telephone 01246 515550. Non-registered patients can be seen privately by the Doctors at Group Surgery. If you would like a private appointment (minimum 30 minutes), please ask reception for details. Certain services provided are not covered by the NHS and you will be asked to pay a fee for a non-NHS procedure. Please see the notice at the reception desk for a full list of fees or download it HERE. Please do not hesitate to ask if you have any queries about our fees. NHS sick notes are only provided for Social Security reasons to cover absences of greater than 6 days off work. Self-certification forms should be used for situations where you have been off work for less than seven days. Any sick notes can only be given if you have attended the surgery during the time of your illness. Advocacy is about standing with someone and encouraging and supporting them to know what they want in their lives and what they want to say and to have that want voiced. Many people have family representatives but on occasions a patient may need someone independent to stand in their corner. That is what an advocate does. 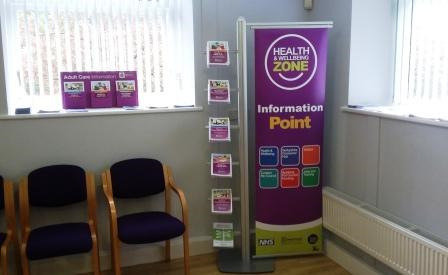 The practice is delighted to see the arrival of a Health and Wellbeing Zone provided by Derbyshire County Council which we hope will improve access to information relating to council run services. The Practice has Health and Wellbeing workers at the practice twice a week. If anyone is interested in accessing the services offered please speak to reception.